“Ikiru” is a film about a meaningless life (a life as everyday survival patterned by fun, innocent vanities, etc.) and about its existentially spiritual overcoming. Kanji Watanabe is the Chief of a Section in a large bureaucratic institution established to process the people’s complains and requests about the improvement of their living conditions. Bureaucracy of this kind was created by the government of Imperial Japan as a protective layer between those on the top of the social hierarchy – the decision-makers, and masses of people. 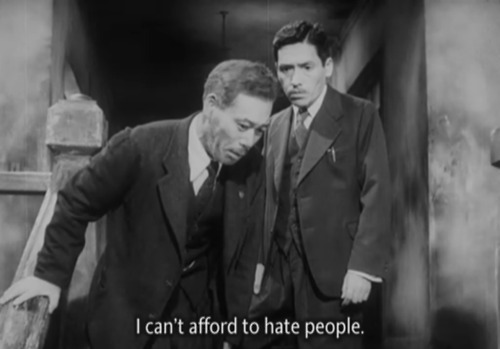 While the officially declared – propagandist goal of the existence of dense and impenetrable bureaucracy like the one depicted in “Ikiru” is a very humanistic one – to help people in their everyday survival, the real task of the bureaucratic caste, according to Kurosawa, is to do nothing – just register complains and refuse them or send them to another department of the same institution for the same result. For the European and American viewers this type of bureaucracy is not completely known – the Federal, State and local bureaucracies in US, for example, are really dedicated to help people (and it is true even today in spite of the first steps of austerity measures promoted by the Republican politicians). But the Western equivalent of Japanese pre- and post-WWII bureaucrats is the corporate bureaucracies created to invent new, more effective ways to make profits for the financial elites and detour the laws controlling financial conduct. These specialists in financial trickery and economic fraud today are quite similar with the bureaucrats represented in the film, while they go much farther – their task is not just to ignore the needs of the wide population (they work for the1%), but to find ways to squeeze money from the taxpayers – the majority through austerity – reduction and elimination of human services and programs. In other words, corporate bureaucracy is not just “doing nothing for people”, but elaborates and applies ways to hurt them. With this socio-political background, the main concern of the film is how to save a person like Watanabe from being a part of the system indifferent to people’s needs and the growing poverty and through this try to improve the institutionalized service to people. The political system of social injustice and indifference creates a special type of people who through participating in it internalize injustice into their psyche in the form of deadening of their soul and a pernicious dehumanization of their heart. These people turn into a kind of living dead. How to help Watanabe to become alive again? How to shake his deadliness, how to save him from conformism? Salvation of Watanabe comes from unexpected place – from his terminal illness. It is fear of death from a stomach cancer (which, according to specialists, will make him dead in no more than six months) what plays the role of spiritual catalyst triggering in Watanabe a yearning for meaning of life. Fear of death created in him desire to live creatively, and this desire to really live – his intense search for the meaning of life. But Watanabe’s existential rejuvenation could never happen without his unexpected friendship with a simple young girl full of vitality, who by spending time with him, and sharing with him her own difficulties and attempts to find meaning, helps him in his existentially spiritual transfiguration. Watanabe suddenly understood that he, first, has to save his life from meaninglessness, and then death will lose its despotic power. To provide real help to the children of the poor, to care about human next generations – to make a difference in this world becomes for Watanabe the equivalent of continuing to live after death. 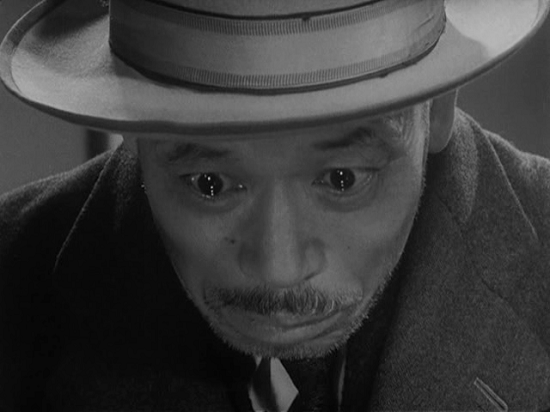 “Ikiru” is communicating with the viewers directly in the language of human heart. The acting of Takashi Shimura (Watanabe) and Miki Odagiri (Toyo) is without any entertaining vanity. It is dedicated completely to finding and expressing the truth of both characters. Director’s and our rapport with Watanabe and Toyo is a sacred experience – the film translates the religious problematic into secular terms and by this makes religious transcendentalism resurrect in existential spirituality and start to live. By the magic of Kurosawa’s genius the film about death became the film about life when a person’s dedication to other people’s needs and future echoes inside him as his own immortality. ▶ Ikiru (1952) pt. 1 – Video Dailymotion. ▶ Ikiru (1952) pt. 2 – Video Dailymotion. ▶ Ikiru (1952) pt. 3 – Video Dailymotion. Confronting his terminal illness Watanabe understood what human life is about. But this revelation didn’t break him because his pseudo-life was already broken. It healed him. Watanabe is rushing to awaken into a meaning of life before it’s too late. He knows that meaning of life is the only eternity which can exist for us. 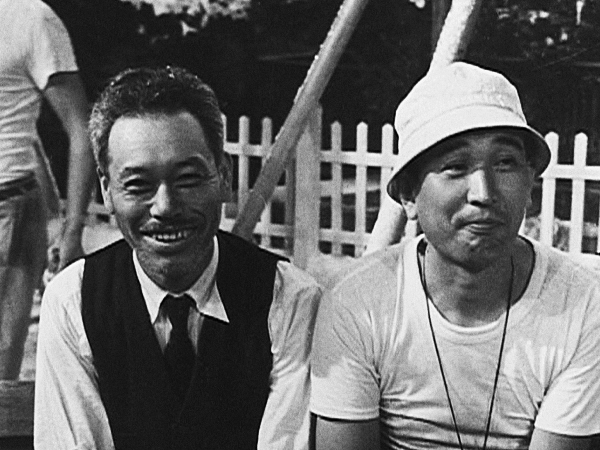 Kurosawa (to the right) and Takashi Shimura after completing shooting of “Ikiru”… Look how joyful Kurosawa is and how happy is Shimura, as happy as his Watanabe was after what he was able to achieve.